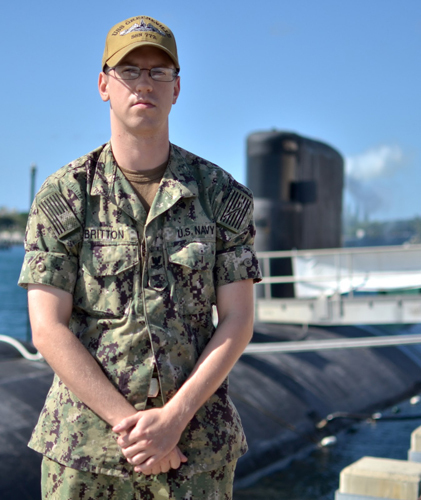 Petty Officer 2nd Class Michael Britton works as a electronics technician (nuclear) serving aboard the Pearl Harbor-based submarine, one of 56 fast-attack submarines in the U.S. Navy. A Navy electronics technician (nuclear) is responsible for maintaining and operating the equipment used to operate the reactor. "Our submarine teams are small, elite, and rely heavily on extraordinary individual performance," said Rear Adm. Daryl L. Caudle, commander, Submarine Forces, U.S. Pacific Fleet. "It is no surprise that our sailors continue to set the standard for excellence, and the country continues to be well served by their service and sacrifice. I couldn't be more proud to lead this professional fighting force." Britton also has military ties with family members who have previously served and is honored to carry on the family tradition. Challenging submarine living conditions build strong fellowship among the elite crew, Navy Officials explained. The crews are highly motivated, and quickly adapt to changing conditions. It is a busy life of specialized work, watches and drills. “Serving in the Navy means putting in my time to serve the country,” added Britton.